was discovered by Pierre Méchain in 1781 and is classified an Sab Seyfert-class spiral. 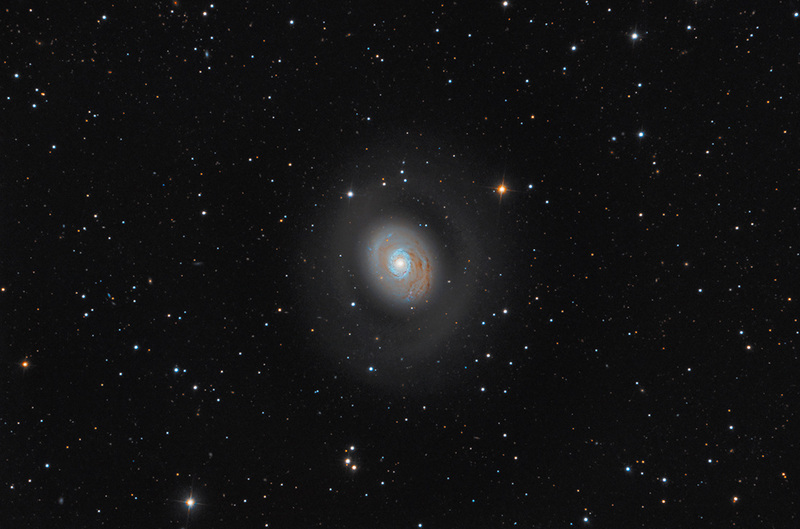 At 15 million light-years distance, M94 is one of the closer galaxies beyond our Local Group. This 'face-on' is a staggering 30,000 light-years across. Due to its extremely bright inner region, it is considered a 'starburst galaxy' and chains of pink, star-forming regions can be seen near its nucleus. Because of M94's relative proximity, astronomers can explore the reasons for this eruption. Outside its core typical spiral arms present dim dust lanes and an older, yellowish stellar population. A 2008 study showed that the Cat's Eye galaxy has very little dark matter present. This result was controversial, as current models cannot account for a galaxy forming without dark matter. M94 is one of the brightest galaxies of nearly two dozen within the Canes Venatici I Cloud, a grouping within the larger Virgo Supercluster of galaxies. Note the incredible faint ring which surrounds the galaxy.